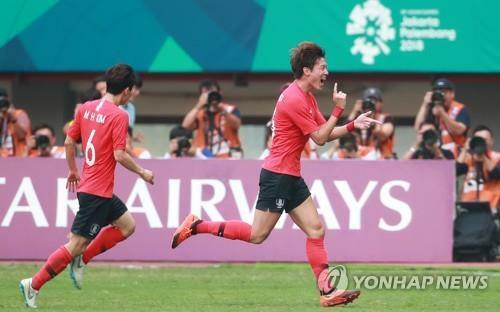 BEKSASI, Indonesia, Aug. 27 (Yonhap) — South Korea beat Uzbekistan 4-3 in extra time to reach the men’s football semifinals at the 18th Asian Games on Monday. Hwang Hee-chan scored the winning penalty, in addition to Hwang Ui-jo’s hat trick, to help South Korea’s under-23 side knock out Uzbekistan in a thrilling men’s football quarterfinal match at Patriot Chandrabhaga Stadium in Bekasi, east of Jakarta. The defending champions will next face the winners of the match between Vietnam and Syria at Pakansari Stadium in Cinibong, west of Jakarata, on Wednesday. South Korea’s Hwang Ui-jo (R) celebrates after scoring a goal against Uzbekistan in the men’s football quarterfinal match at the 18th Asian Games at Patriot Chandrabhaga Stadium in Bekasi, east of Jakarta, on Aug. 27, 2018.